This one is even bigger than the other one (almost 7" tall). I just got this one last week from the truck stop, it was $24.00 and some change. It does not have a brand name or any markings saying who made or anything like that. I was right there when it was bought, if they are still being sold at the truck stop I will look at the display box and see if it says who makes them. This is it next to the other big lighter. These lighters get dirty fast. fingerprints are all over it,lol. I wipe them down and the next thing I know they are covered in fingerprints. yesterday my Bf got me another big one, similar to this one. I am checking out lighters on eBay. I am so tempted to buy. We've got one of those 7 inch models as well! 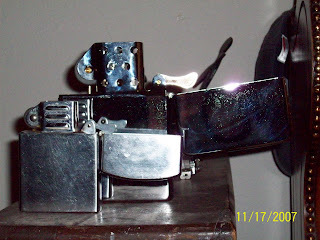 Thinking of selling it on Ebay... can you suggest what category it should be because like you say, theye are NOT a Zippo.